We seek an outstanding senior scientist for a tenured endowed full professor position. We want a bold innovator working at the interface between the life sciences and physical sciences. We seek expertise in the physical biology of cell actions -- principles, mechanisms, adaptation/evolution. Examples include -- but are not limited to -- cellular networks, single-cell experiments, fitness landscapes and stochastic dynamics. We focus on basic research, but are cognizant of the impacts on challenges such as aging, amyloid diseases, cancer, or drug resistance. 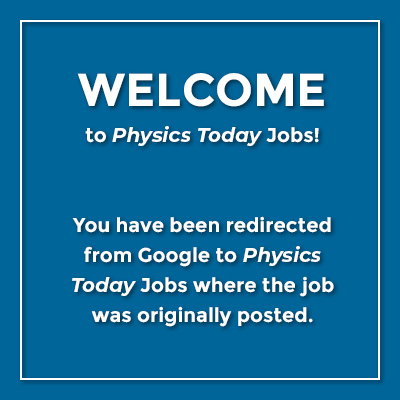 We prefer an experimentalist, but we welcome applications from theorists. This is a basic-research position, with minimal teaching. It has attractive resources, including a Laufer Endowed chair that provides some annual research support. The successful individual will have considerable freedom to choose his or her departmental affiliation. Preference will be given to a candidate with leadership skills who can help guide the Center's future. The Laufer Center is an exciting collaborative cross-disciplinary place for physical and quantitative biology at Stony Brook University, just minutes from Stony Brook Medicine, comprising the Renaissance School of Medicine and the Stony Brook Cancer Center. We have researchers from Biomedical Engineering, Chemistry, Physics, Applied Mathematics and Statistics, Computer Science, Pharmacology, Molecular Genetics and Microbiology, and Ecology and Evolution, and close ties to our neighbors at Cold Spring Harbor Laboratory and Brookhaven National Laboratory. Stony Brook is in a beautiful mid-Long-Island location on the LI Sound with outstanding local schools, 70 miles from New York City. Candidates must have a PhD and a strong record of research productivity in relevant field. Stony Brook University is an affirmative action/equal opportunity employer and educator.